Restoration works are in progress at Villa de Argote, situated at the botanic side of the Argotti Gardens, in Floriana. Tourism Minister Francis Zammit Dimech, who visited the villa, said that when the curator of the Argotti Gardens, through the University of Malta, had requested assistance for the restoration of the villa, the Malta Tourism Authority had agreed to fork out Lm8,000. 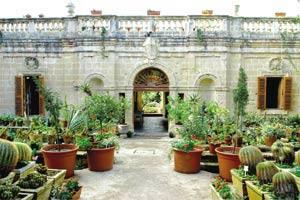 Apart from the fact that Villa de Argote was a historic building dating back 250 years and that the botanic gardens know their origin to 1674, the gardens are an attraction to the Maltese public and tourists, Dr Zammit Dimech said. The Argotti Gardens were built on land bought by de Argote et Guzman at the time of Grandmaster Manoel Pinto de Fonseca.